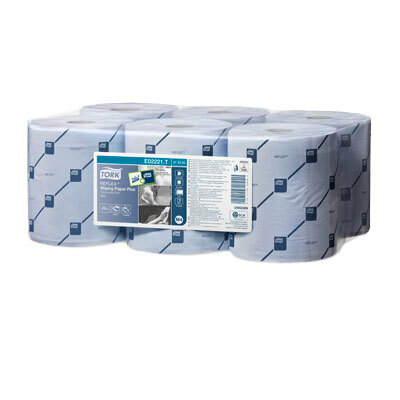 These Tork Reflex Wiping Paper rolls are ideal for all sorts of wiping and cleaning needs. Their 2ply construction has a high absorbency and strength while wet and are food contact approved for use in catering environments. Each of these large rolls provides you with approximately 150 meters of cleaning power and can be used with the corresponding dispenser. From offices through to nurseries, replenish outstanding stock with these handy wiping paper rolls. For the most organised and professional environment, we stock the Tork Reflex Single Sheet Centrefeed Dispenser M4. To ensure your business complies with current hygiene regimes, consider stocking up on the Gompels Antibacterial Surface Spray 750ml x 6 at the same time.